(Beirut) – Egyptian prosecutors should drop all charges against at least 26 workers who were arrested and charged in recent months in connection with peaceful strikes and protests, Human Rights Watch said today. The parliament should also revise a new trade unions draft law to fully legalize independent unions and amend penal code provisions that criminalize the right to organize and strike. Since May 2016, police have arrested scores of striking workers from various industries. Most were later released, but prosecutors have referred dozens for trial, including some before a military court. “Arresting workers for striking is another example of how Egyptian authorities are determined to stifle all space for peaceful mobilization,” said Joe Stork, deputy Middle East and North Africa director at Human Rights Watch. In January 2017, prosecutors charged 19 striking workers at an oil products factory in Suez with inciting a strike and halting production, though all were acquitted in a trial later that month. In December 2016, security forces arrested at least 55 striking workers at the Egyptian Fertilizers Company, and prosecutors summoned eight for investigation. On September 26, Kamal Abbas, a member of the government-sponsored National Council for Human Rights and head of the independent Center for Trade Union and Workers’ Services (CTUWS), wrote to the Interior Ministry regarding the National Security Agency’s “disappearance” of six workers from the Public Transport Authority following raids on their homes two days earlier. On September 28, following a news conference by families of the missing workers, the six workers appeared before prosecutors who accused them of belonging to an unidentified banned group. In May, military prosecutors referred 26 Alexandria Shipyard Company workers to a military court on charges of inciting strikes. The January strike in Suez followed a sit-in at the privately owned IFFCO oil products factory in the last week of December seeking an equal distribution of bonuses between workers and supervisors. The workers decided to strike after Interior Ministry officersarrested two members of the IFFCO Independent Workers’ Union who had been participating in the sit-in, according to a workers’ statement published in local newspapers. The CTUWS said that National Security officers demanded that union leaders end the strike and then police arrested 13 striking workers on January 2. Prosecutors summoned another 10 for questioning on the same day and referred 19 to a minor offenses court on charges of inciting a strike, halting production, and sabotaging factory properties. Though the court acquitted the workers, the factory administration can appeal the decision. Activists told Human Rights Watch that, according to workers, 26 people were later fired, including the 19 who were acquitted. Union leaders at the IFFCO factory demanded a larger share of bonuses after the prices of everyday goods in Egypt rose dramatically when the government floated the Egyptian pound in early November, a requirement for a US$12 billion International Monetary Fund (IMF) loan package. Since then, the pound has lost more than 100 percent of its value, and the IMF has estimated that inflation will rise to 18 percent. Egyptian authorities greatly restrict the ability of workers to mobilize independently, and the penal code criminalizes strikes and workplace sit-ins in articles 124 and 125, with sentences of up to two years, despite several administrative court rulings that have upheld the right to strike. Kamal Abbas, the CTUWS leader, told Human Rights Watch that the government-controlled Egyptian Trade Union Federation (ETUF) sent a letter to the administration of the Suez oil products factory saying that the independent workers’ union, which had signed two collective bargaining agreements with administrators in 2012 and 2015, was illegal. The IFFCO Independent Workers’ Union could be shut down as a result. The government has never legalized the independent labor unions that proliferated after the 2011 uprising, while officially recognized unions have not held elections for 11 years, and successive governments have appointed union leaders, most recently in January. In June, an administrative court sent the current, restrictive 1976 law on unions for review, stating that “the [ETUF] was not capable of expressing workers’ grievances and hopes whether before the state or business owners.” To Human Rights Watch’s knowledge, the Supreme Constitutional Court has yet to take up the case. In April 2016, Human Rights Watch called on the Egyptian authorities to legalize independent unions and criticized a draft law that would dissolve independent unions and restrict workers’ rights. The cabinet approved a modified draft in July and sent it to parliament on January 25. The current draft would not recognize existing independent unions and would impose prison sentences for establishing unions that do not follow the new law. The sharp devaluation of the Egyptian pound also led to strikes in November and December at two privately owned fertilizer companies in the Suez governorate, Egyptian Fertilizers Company and the Egyptian Basic Industries Corporation, the independent news website Mada Masr reported. Police dawn raids ended both sit-ins, and police rounded up at least 55 workers, one worker participating in the sit-in told Human Rights Watch. Central Security Force riot police put the arrested workers inside vans and dropped them in a deserted area three hours later, the worker said. Prosecutors detained two for several weeksbefore releasing them on bail, and the factory administration dismissed six with no explanation, the worker said. The two factories have no unions. A representative for the Egyptian Fertilizers Company told Human Rights Watch that police tried for 10 days to convince workers occupying control rooms to leave before “very peacefully” ending the sit-in. The workers returned to work the following morning. He said that halting production was a crime and acknowledged that prosecutors summoned several workers, but said the administration had not made complaints against them during the investigations. Workers denied the administration’s allegations that they stopped the production or occupied the control room. Dawn raids also led to the arrest of six Public Transport Authority workers from their homes in Cairo on September 24, ahead of a planned strike demanding bonuses. Authorities did not acknowledge their whereabouts for four days, CTUWS leader Kamal Abbas told Human Rights Watch, adding that lawyers had not been allowed to obtain a copy of prosecution documents as required by law. Prosecutors accused the six of joining a banned group that prosecutors did not identify, inciting strikes, and disturbing public order, pro-government news websites reported. Two of the workers remain in pretrial detention, while authorities released four pending investigation. Egypt’s military has also suppressed workers’ actions. In Alexandria, 26 workers of the military-owned Alexandria Shipyard Company have been on trial before a military court since June 21, 2016. A report by the Egyptian Center for Economic and Social Rights(ECESR) said the workers had organized a brief protest inside the company’s premises on May 23 and 24, to demand bonuses, promotions, and safety equipment and tried to negotiate with General Abd al-Hamid Essmat, the company’s executive. On May 25, military prosecutors ordered 13 workers held pending investigation. One, a woman, was released on bail. Thirteen others were arrested weeks later. Fatma Ramadan, the head of an independent union and a workers’ rights researcher, told Human Rights Watch that military prosecutors relied entirely on a memo from the company to charge the workers with inciting strikes and abstaining from work. Human Rights Watch was not able to review the memo. After several days, the company allowed 1,100 of 2,800 workers to return, the ECESR said. The shipyard administration told workers they would be released if they resigned, said Abbas and an ECESR lawyer. All the prosecuted workers resigned and were released on bailin groups in October, November, and December, but they still face trial. Military prosecutors referred the striking workers to military court under the Military Code of Justice, which covers civilian workers in military-owned institutions and does not establish any workers’ rights. The current draft unions law would not change this. 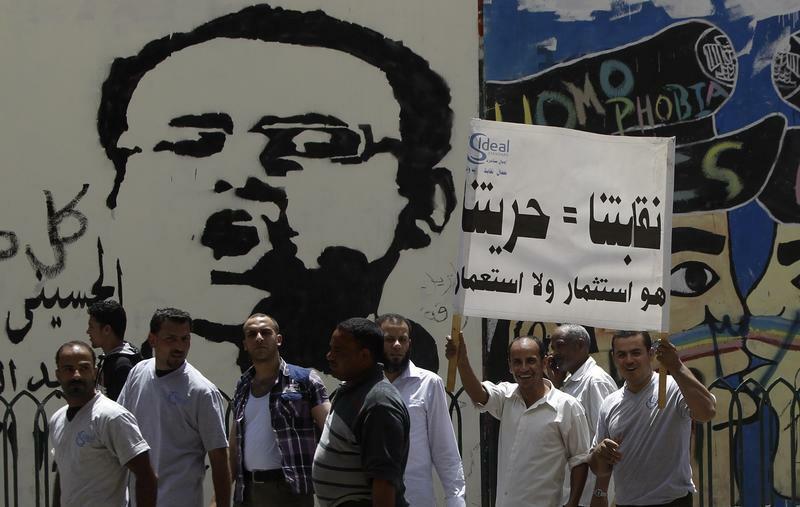 Egypt’s constitution grants freedom of association and the right to strike. Egypt is a state party to the International Covenant on Economic, Social and Cultural Rights, article 8 of which establishes the right to strike, as well as the right to form and join trade unions and national and international confederations. Egypt is also a member of the International Labour Organization and has ratified its eight fundamental conventions. Parliament should ensure that the draft union law under consideration meets Egypt’s obligations under international human rights law by allowing free and fair union elections and ensuring straightforward legalization procedures for all existing independent unions. Civilian workers in military institutions should be allowed association rights and should never be tried before military courts. Human Rights Watch wrote to IFFCO, the Public Transport Authority, and the Alexandria Shipyard Company, regarding the incidents but received no responses. “Instead of arresting and prosecuting workers, the government should amend its laws to guarantee workers’ rights to effective bargaining and mobilization which are essential to effective economic reform,” Stork said.